Pouring concrete around PVC pipes can be useful in a variety of household and industrial applications, such as building garden ponds or installing outdoor plumbing. The job can be simple and cost-effective when the correct preparations and techniques are applied. Difficulties and setbacks can arise when the right foundations are not laid, if the concrete mix is too dry or if the seal around the PVC pipe is insufficient. Work methodically and efficiently for a good concrete-to-PVC pipe seal. Pour a 2-inch thick layer of gravel over the base of the trench. Spread the gravel evenly using a spade or rake. This will create a drainage layer and a supportive structure for your concrete. Clean the pipe to remove dirt and debris that could reduce the effectiveness of the concrete-to-PVC seal. Mix enough concrete to fill the area you require using water and "hydraulic" cement powder; prepare the mix in a large, plastic container. Hydraulic cement expands as it cures, and will form a tightly packed structure around the PVC pipe. Install large structures -- such as a patio -- using a concrete thickness of no more than 6 inches if layering over PVC pipes. Install a closet flange around the PVC pipe to add structure and to provide an anchor. Glue the PVC pipe into the closet flange at each side using strong glue. The closet flange forms a centralized path for the concrete mixture, and also acts as a barrier to flowing ground water. Using a reliably fixed closet flange will prevent damage to the concrete and PVC pipe structure due to ground vibration, vibration in nearby plumbing, freezing and other conditions. Run a thin layer of silicone sealant along the edges of the pipe where the concrete mix will be poured; apply the silicone with a sealant gun and a tube of sealant. Create neat, waterproof edges. Smooth off loose lumps using your fingertip. Pour the mixed concrete around the PVC pipe, using a large, metal funnel or a spade. Pack the concrete around the PVC pipe to prevent air gaps. Wear protective gloves. Pack the layer directly underneath the PVC pipe; it should be packed tight to create a solid, firm foundation and to prevent cracking during temperature fluctuations. Always aim for a complete seal around the PVC pipe. 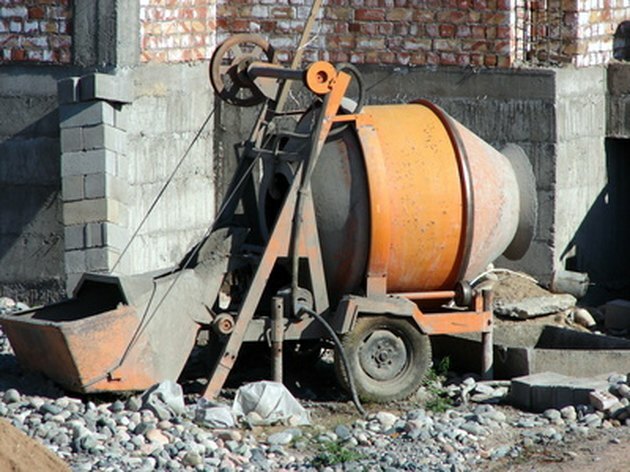 Complete the pouring and adjusting of wet concrete no later than 90 minutes from mixing. Coat the dried concrete with a protective layer of vinyl patching cement, which is waterproof and hardwearing. If your project is for a pond -- or similar water-filled, watertight structure -- layer over a piece of thick, hardwearing cloth or tarpaulin to finish the job properly. How Do I Reroute Water Drain Pipes?